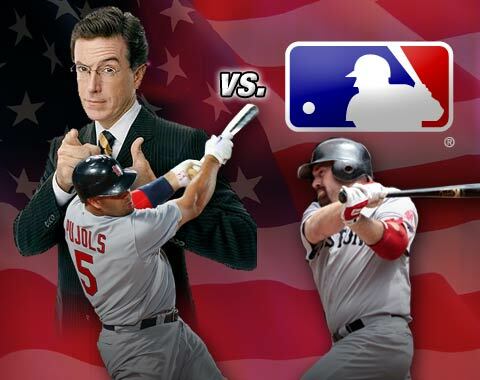 With Day 1 in the books, the Colbert Challenge is all square: One game for Stephen Colbert, one game for @MLB. @MLB took an early lead last night when Ichiro Suzuki smacked a clean single up the middle off of Dan Haren to lead off the bottom of the first inning in Seattle. Minutes later, Andre Ethier evened the score with a single of his own off of Bronson Arroyo. Ichiro ultimately finished 2-for-4, while Ethier went 1-for-4. By the total hits tiebreaker, @MLB holds the lead by the slimmest of margins heading into Day 2. In non-Colbert Challenge news, former leader CroFranjo lost their streak at 30 games last night thanks to an 0-fer by Jose Reyes. Our season co-leaders jsmnapoli and leahydpt remain safe at 31 for the time being. Jdc5850 and sebringt are next in line with current 28 game runs. I had him picked for a few days when he went on the DL to have a selection picked until I made my actual pick just incase I forget to make a pick in time but with him back I replaced him with Mark Teixeira. The Phillies and Marlins are also playing a Double Header tomorrow. Highest “No Selection” 😛 pg# 22 with streak of 14 back to zero. Yesterday’s Top2500 Reset rate was % with JOSE REYES reseting the most. There was also % PPD due to players not playing. These streakers do not reset, but did not increase either. No Hitter Alert: J.Verlander thru 7 innings now & @ 90 pitches, with bottom portion of order coming up in 8th. Just a teaer. O-Dog, 2nd batter in the inning, a sharp single up the middle on a 99 mph fastball. When announced a perfect game/no hitter gets broken up in no time.